This was an amazing issue. It's something that I can actually wholeheartedly recommend to anyone who hasn't even read the previous four issues of the series. Just jump on and read this, and you'll be delighted. This is just delightful. 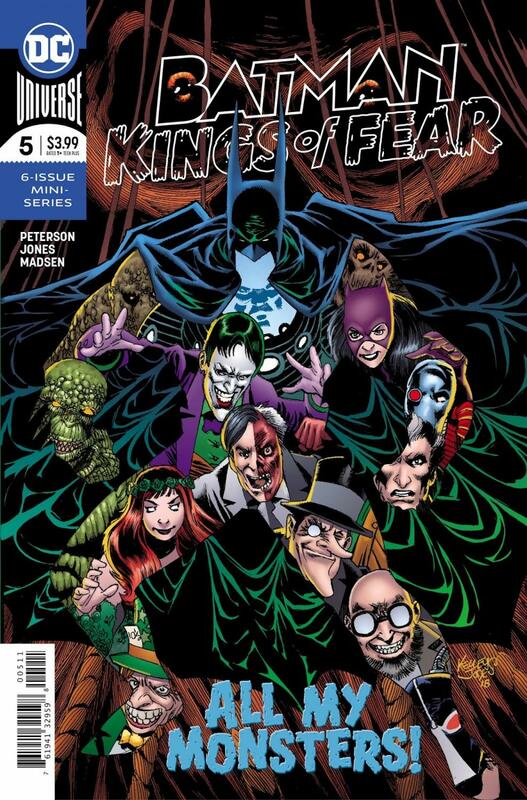 Scott Peterson and Kelley Jones are doing some wonderful work here, and they're out to deconstruct Batman. I know this is a story we've all read thousands of times but their voices are particularly unique here, and that's what makes it shine for me. Scarecrow's slow prodding of Batman's brain and analysing an alternate world where Batman simply wasn't Batman was expertly executed by Jones, who is doing some of the best work I've seen all year. Peterson's take on Scarecrow is one of the fresher perspectives on the character I've seen in the last few years, and is a major reason as to why this series has been really working for me. The lightness and the humour in the story despite the deep delve into why Batman shouldn't exist is a contrast that surprisingly works for me. This is just fantastic. Everyone should be reading this; Peterson's dialogue is expert and Jones' artwork is some of the best of the year.